U.S. families get the new Outlander PHEV for the first time. How fuel-efficient is this SUV? Most families won’t be looking for a plug-in-hybrid, but the new Mitsubishi Outlander PHEV is a family-friendly SUV aimed at the affordable end of the market and it’s also highly fuel efficient. You don’t have to enter the luxury market to get this kind of technology or efficiency. It’s been tested in Europe, on the toughest off-road Australasian Safari, and now U.S. families get the new Outlander PHEV for the first time. This week we drive the top trim 2018 Mitsubishi Outlander PHEV GT S-AWC. The Mitsubishi Outlander PHEV has been in Europe for two years, and it’s new to the U.S. market. The 2018 Mitsubishi Outlander PHEV GT S-AWC ($40,295) gets plenty of standard features like heated front leather seats and dual-zone climate controls, Apple CarPlay and Android Auto underpin the same AM/FM/XM/HD touchscreen audio system. It also comes with 8-way power adjustable driver’s and front passenger seat, 60/40 split fold-down rear seats with independent slide and reclining adjustments (2nd row), tilt/telescopic heated steering wheel, 710-watt Rockford Fosgate premium audio system with 9 speakers, multi-view camera system, and power remote liftgate. The GT model comes with advanced safety features such as Forward Collision Mitigation, Lane Departure Warning, and the Multi-View Camera System. With two AC outlets with a combined 1500W power supply. PHEV-specific features are a four-spoke steering wheel, an EV mode button and a unique shifter on the center console, and shift paddles reconfigured to manipulate the five-level regenerative braking system. A few options came on this PHEV tester including a tonneau cover, PHEV body graphics, hood emblem and carpeted floor mats. Total MSRP including destination: $41,930. Stepping inside the Outlander PHEV, it was not easy to tell the PHEV from a standard Outlander model. 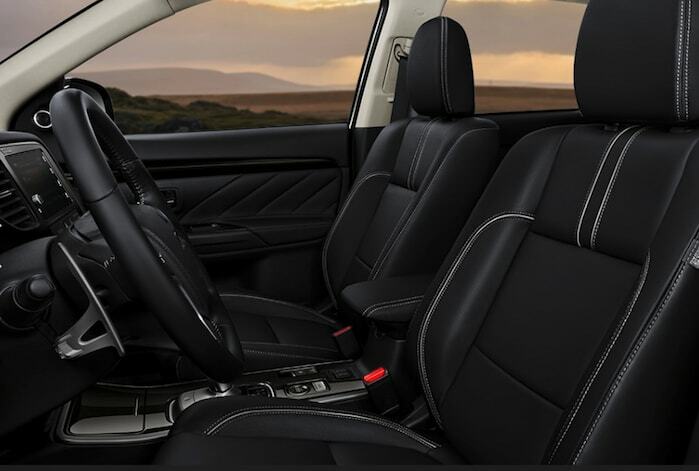 The leather-trimmed seats are comfortable, and there’s plenty of soft-touch materials throughout the cabin. After some time, we noticed the PHEV-specific four-spoke steering wheel, EV mode button and unique shifter on the center console, and shift paddles reconfigured to manipulate the five-level regenerative braking system. We made liberal use of the heated seats and steering wheel, as temperatures dropped in the Denver area this week. Front and rear headroom and legroom are unaffected by the extra PHEV hardware in this model. But the PHEV only has two rows of seats unlike the standard Outlander offering three rows. Cargo room in the PHEV is affected with a higher rear deck, as cargo capacity behind the second row dips from 34.2 to 30.4 cubic feet. There’s also no temporary spare tire under the floor because the PHEV uses that space for the hybrid hardware and substitutes a tire inflation kit instead. What is PHEV? 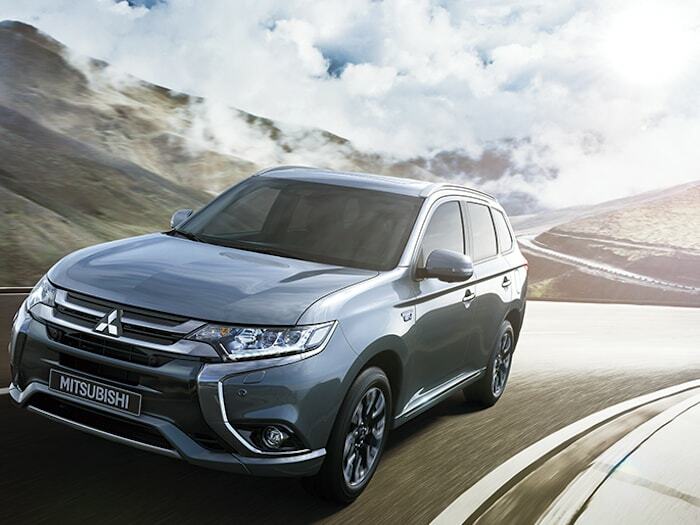 PHEV stands for the plug-in hybrid electric vehicle, technology Mitsubishi has been perfecting for quite some time. The Outlander comes with enough battery power to keep going for an EPA-rated 22 miles, as long as you are on level terrain. The 2018 Mitsubishi Outlander PHEV comes in all-wheel-drive configuration (S-AWC) and gets a total output of 197 horsepower. The front wheels are powered by a 117-horsepower 2.0-liter engine, and it’s mated to a hybrid system, which is composed of a 60-kilowatt electric motor and a generator. There are three ways to charge the hybrid system. You can use a 120-volt Level 1 backup cord taking between eight and 13 hours to recharge. You can use a standard 240-volt Level 2 electric-vehicle charging equipment taking 3.5 hours to recharge, or use 400-volt Level 3 CHAdeMO charging equipment that'll fill the battery to 80 percent in just 25 minutes. Not to worry if you run the battery down to zero. Outlander PHEV has electric motors at both ends and uses regenerative braking in which both drive motors are temporarily reconfigured to use their magnetism to turn motion into electricity. So if you are traveling downhill, you’ll notice the battery gauge on the dash refilling as you drive. EPA fuel mileage estimates are 74 MPGe combined city/highway and 25 mpg gasoline only. The new Mitsubishi Outlander PHEV is an undemanding crossover that’s quiet, comfortable, and well-mannered on the open road. It can seem a bit soft and detached from the driver, and the 2.0-liter engine coupled with the single speed fixed reduction gear transmission is designed for fuel economy and won’t give you unlimited power going uphill. We pushed it hard going up I-70 at 9,000 feet elevation and it held it’s own while hauling two people. Add a full complement of kids and gear and it will struggle, however. If you drive in the city, which most families will, it will supply your needs well. Families who want the security of all-wheel-drive will benefit from Mitsubishi’s many years of rally racing where they perfected the system. The system is called S-AWC, which sends the optimum torque split in every situation, including when just one wheel is on ice. We were able to test the SEL on snow-covered roads in the mountains and we felt confident in the Outlander’s ability to get us anywhere safe and secure. If you need an affordable five-seat family crossover, the Mitsubishi Outlander PHEV gives you a good bang for the buck. You don’t have to enter the luxury market to get plug-in-hybrid technology or efficiency. If you need all-wheel-drive, Mitsubishi has one of the best.